kirtan - sattvic, rajasic or both? 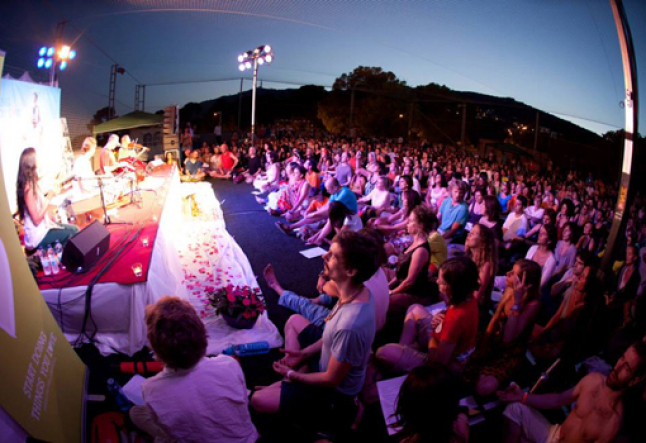 I am in Barcelona for the Barcelona Yoga Conference (BYC). If you haven't been or heard about this event yet you will. The BYC is organized by the beautiful Castellsaque family, which is headed by the siblings Pau, Wari and Isis. 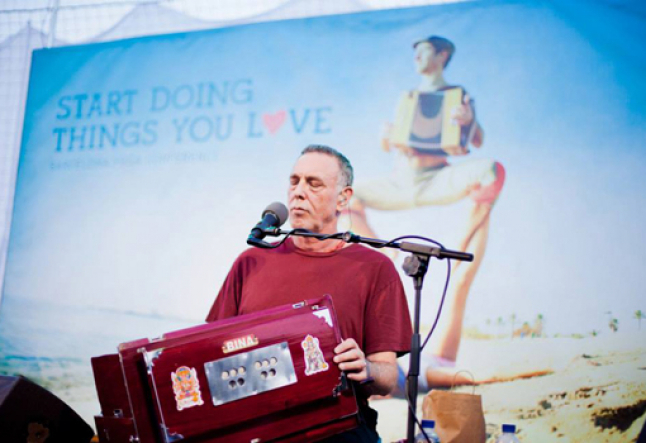 They have succeeded in their mission of obtaining Krishna Das (KD) in as the festival headliner. With no detail left unattended, we are gathered in the open- air roof top tennis court equipped with AstroTurf for ample floor seating. 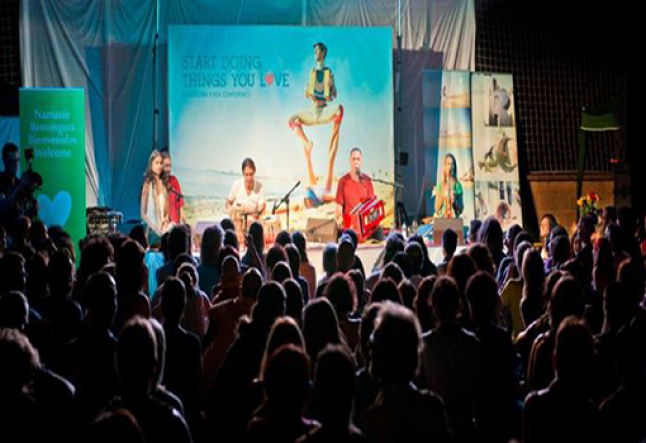 The backdrop is a stunning photograph of joyful acro yogis on the beach, taken by Wari. It is so large and inviting it looks as if Arjun Bruggeman (KD's tabla player) is seated in the sand. A stellar light and sound system is assembled and the 900 international yogis gathered for this momentous occasion are ready to party. Here in Barcelona, the crowd has always been lively. Is it the passion of Spain that stimulates all this emotion? Is it the playful quality the acro yogi Kula possesses? Or could it be the celebratory feeling an international reunion manifests? Whatever the reason...these people are ready to rock. Because I had the honor of playing just before KD on a different stage, I arrive a little late and find a place for myself with a friend at the back. It is an incredible picture to walk into. On each side of the seated audience there are pools of people on their feet. They are rocking it...dancing like their lives depended upon it. At a certain point into the concert, the 2 pools begin to connect. 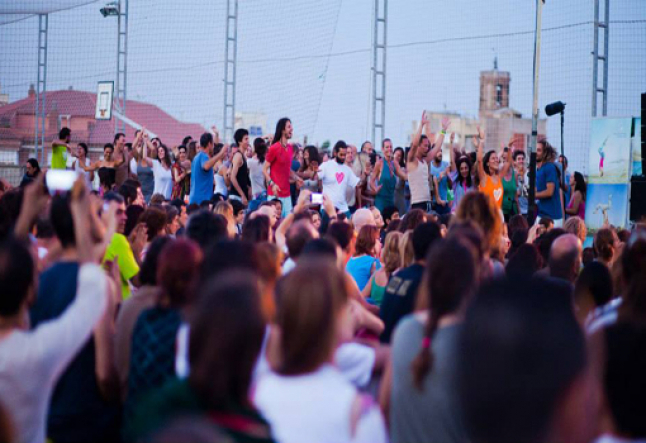 Yogis are dancing just in front of the stage back and forth from one ecstatic pool to the other. Arms in the air, dreadlocks and hair flying by Arjun and KD with each lap. Happy people. The kirtan finishes and there is silence-- followed by some applause. This crowd cannot be silent. Arjun immediately leans into what seems like a complaint about the dancing and KD responds without hesitation, "OK everybody Sit down!" I don't know what Arjun actually said or why they wanted people to sit. Was it disturbing to them? Were they concerned it was disturbing others? It is likely he was concerned for all our safety as the floor was visible moving under our feet. Regardless the reason it triggered something in me--a memory from the Sivananda Ashram (Bahamas) where I did my teacher training. It was a very traditional program and a flavor I felt I wanted in my bag of experience at the time. As I danced during satsung in the open pavilion temple, I was quickly told that this was Not allowed. This rajasic behavior was frowned upon, as it would only eventually land in a tamasic state-- turning the mind into a roller coaster of emotional ups and downs. I asked the Swami, “Aren't kirtans in India incredibly wild and rajasic?" He said, "Yes. There are many ways and many schools. This is ours". We were advised to practice internalizing such ecstasy and maintaining a sattvic state--Well-balanced emotional state regardless of the external conditions and factors. In theory I understood and obeyed but this idea has never rested well with me. Are we supposed to willfully turn ourselves into robots? I love the idea of quieting the ‘yo-yo mind’ but isn't releasing emotion cleansing and healthy? 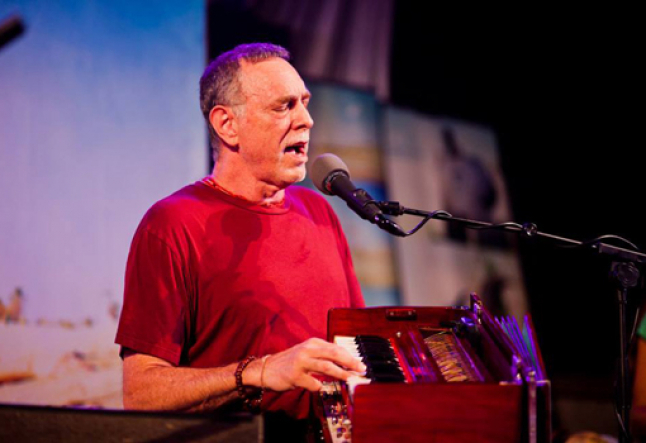 Can’t Kirtan be used in different ways, serving different people in different states of mind simultaneously? Sometimes, in Kirtan, I just want to lie on the ground and take in the energy, and, other times I want to add mine to the collective, singing loudly and dancing wildly. What do you think? Share your insights in the comments box below.